Bus from Kuala Lumpur to Taiping is the most economical way to get to Taiping. This bus route is popular for working adults and students in Kuala Lumpur with their hometown in Taiping. Bus service for this route remains competitive in today context even with the stiff competition from ETS train service from KL Sentral to Taiping train station. One of the main reason why passengers taking bus from Kuala Lumpur to Taiping is because of the frequent bus schedule as compared to train schedule. Besides that, ETS train is always sold out fast due to competition from passengers going to other destinations like Kuala Kangsar, Bagan Serai, Parit Bundar, Butterworth. Hence, bus service remains as the popular option to travel from Kuala Lumpur to Taiping. Konsortium Bus Express, StarMart Express and Transnasional are the few bus operators providing bus services from Kuala Lumpur to Taiping. Konsortium Bus Express is the dominant player for this route service by having more than 16 daily departures from Kuala Lumpur to Taiping. The first bus service starts as early as morning 7.45am and the last bus leave the TBS bus terminal at night 11.59pm. The bus fare from Kuala Lumpur to Taiping is at about RM 27.00. 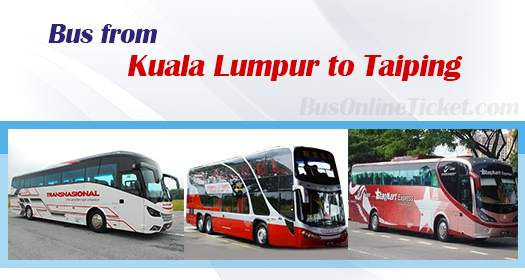 Duration for bus from Kuala Lumpur to Taiping is usually takes about 4 hours, depending on traffic condition. At least 1 washroom break will be given during the journey. There are 2 convenient boarding points in Kuala Lumpur for bus service to Taiping including TBS (Terminal Bersepadu Selatan) and Hentian Duta. The arrival point in Taiping from Kuala Lumpur is located either at Medan Simpang or Kamunting Bus Terminal, depending on your selection of drop-off point. With convenient online booking service and various choices of bus operators and departure points, this makes BusOnlineTicket.com become one of the most popular online booking portal among its customers throughout these years. Hurry up and book your bus ticket before they sold out!